We just received a shipment of these pens and began photographing them. They look so much nicer in person and have a definite late 1950s vibe, evoking the metal cap Safari. Esterbrook dealers should have these pens in stock now. 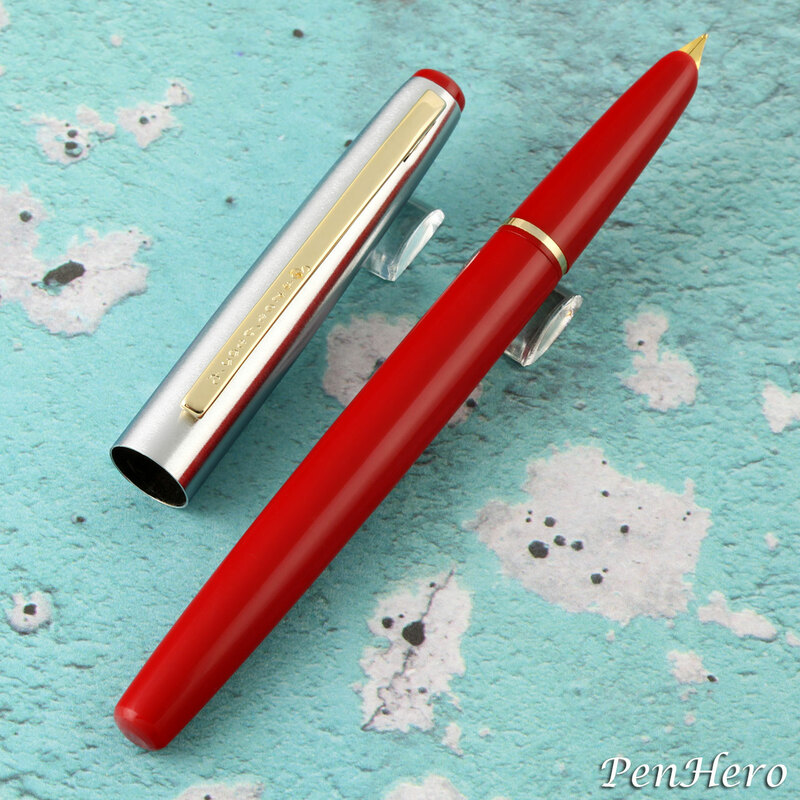 This is the new Esterbrook Phaeton 300R Signal Red fountain pen. It's 5 1/2 inches long and features a gold plated hooded stainless steel medium nib. The barrel comes in vintage looking acrylic colors including Signal Red, Mineral Blue, Spruce Green and Midnight Black. The pull off cap is brushed chrome plated metal with a long gold plated clip and the cap top finial matches the barrel color. It uses a removable plunger style filling system which acts like a syringe to draw ink from the bottle. Retail price is $85. I'd be interested in seeing if this is close to the original Phaeton pens. It at least has a similar look and the nib appears to be about right. This is the new Esterbrook Phaeton 300R Mineral Blue fountain pen. It's 5 1/2 inches long and features a gold plated hooded stainless steel medium nib. The barrel comes in vintage looking acrylic colors including Signal Red, Mineral Blue, Spruce Green and Midnight Black. The pull off cap is brushed chrome plated metal with a long gold plated clip and the cap top finial matches the barrel color. It uses a removable plunger style filling system which acts like a syringe to draw ink from the bottle. Retail price is $85. FYI. The new Esterbrook Phaeton is not made in India. It is not a rebranded Kanwrite. It's made in Taiwan. We had discussions with Kenro, and thought I would pass this along. It's not a rebranded version of an existing pen. The cap is designed so it won’t scratch the section of the pen. It has an inner seal to keep the nib wet and not dry out. The barrel is made from an acrylic that is buffed to a high polish and does not emit an odor like some cheap plastics. The clip is new and only used on this pen. The nib is also a new design and only on this pen. I have one of the original Phaeton pens, and I've noted a lot of similarities to Venus pens of that time. 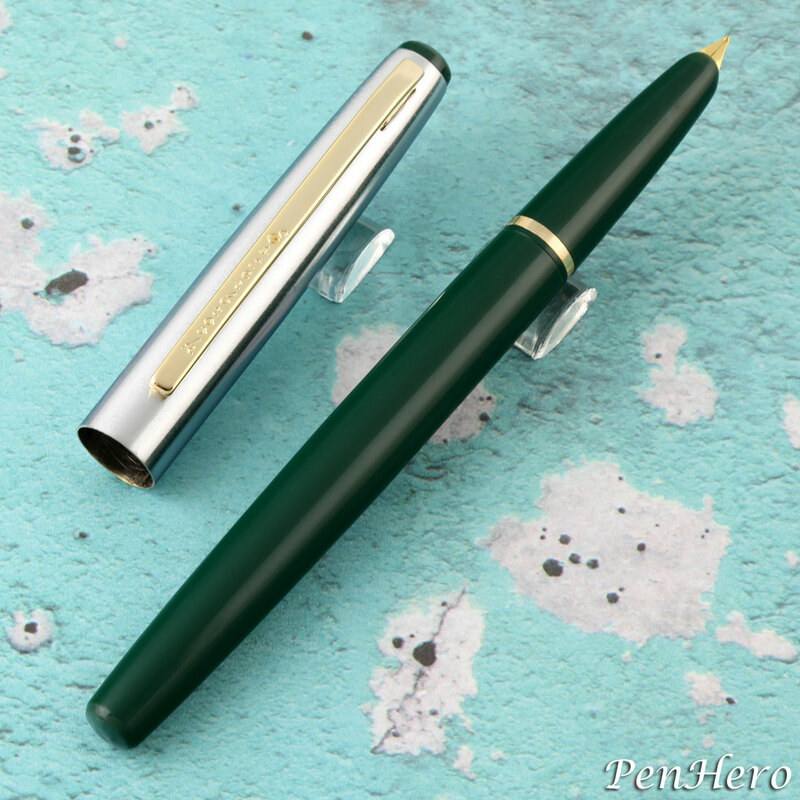 This is the new Esterbrook Phaeton 300R Spruce Green fountain pen. 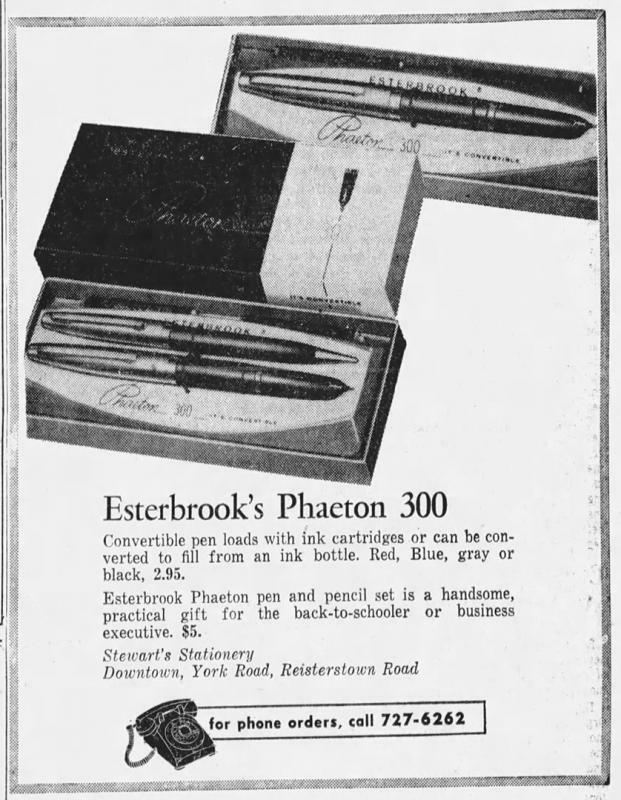 The original Phaeton 300 cartridge / converter pen was announced by Esterbrook in September 1964 and advertisements by dealers for the new pen continued through at least 1966. The original pen came in red, blue, gray and black with extra fine, fine, medium and broad gold plated hooded nibs and retailed for $2.95. The new Pheaton 300R is 5 1/2 inches long and features a gold plated hooded stainless steel medium nib. The barrel comes in vintage looking acrylic colors including Signal Red, Mineral Blue, Spruce Green and Midnight Black. The pull off cap is brushed chrome plated metal with a long gold plated clip and the cap top finial matches the barrel color. It uses a removable plunger style filling system which acts like a syringe to draw ink from the bottle. Retail price is $85. This is an ad from The Baltimore Sun on August 24, 1965. I hope these new pens work better than the classic Phaetons from back in the day. 5 1/2 inches long and features a gold plated hooded stainless steel medium nib. The barrel comes in vintage looking acrylic colors including Signal Red, Mineral Blue, Spruce Green and Midnight Black. The pull off cap is brushed chrome plated metal with a long gold plated clip and the cap top finial matches the barrel color. It uses a removable plunger style filling system which acts like a syringe to draw ink from the bottle. Retail price is $85. $2.95 in 1966 would be $23 today adjusted for inflation. I would buy it for $23. Currently inked: Delta Dolcevita Oversize, Sailor Reglus, Sailor 1911 Standard, Montblanc 149, Pilot Custom Heritage 92, Pilot Volex. Inked with: Sailor Blue Black, Private Reserve Ebony Blue, Waterman Inspired Blue. For this price I got myself Sailor 1911 Standard. Beautiful nib. This Esterbrook is very much the style I like. But it shouldnt cost more than a Lamy Al Star. So I will pass. Thank you for the information.Similar look, different materials.